My favorite perk of writing about games is always going to be the early demos of games I’m excited to see. The feeling of hopping into a demo for an upcoming game is akin to Christmas morning as a child. The packaging might be a bit rough, and the edges unfinished, but the body of the game is there to explore and play with, and that makes up for the rest. Even more fun is watching how a game changes from alpha demos to beta testing, on to press review copies and final release. Watching a game grow from its awkward teenage stage to a polished final product is rewarding. Remothered: Tormented Fathers is going to be one of those rewarding experiences. Lead developer Chris Darril was kind enough to send over a very early-stage demo for us to try out after sending over the original game announcement and stills. The still screens from this game are gorgeous, and that can often lead to worry about a new game. The prettier the still frames are, the more chance that actual gameplay won’t live up to expectations. Remothered managed to completely avoid that problem. Even as an alpha demo, any area in the entire house could be captured and used as a promotional shot. Any old cabinet or window would do, and that makes for a surprisingly pleasant gaming experience. As a note, I had some trouble getting screenshots of the demo, so the images here are premotional shots from the Remothered website. Because the demo is still in alpha stages, there are many spaces in the game that are obviously waiting for further development. Every cabinet door and drawer I touched could be opened, but all are empty. By the time players jump into the finished version of the game, Chris tells me there will be items hidden in most of these. Collectibles, inventory items, and keys will be hidden among the dozens of nooks and crannies scattered throughout the mansion. Once picked up, items are easy to access and equip using the sleek inventory system. Space is limited, so players will need to remember where replacement items are in lieu of stocking up as they explore. While the items to be hidden inside drawers are not in place, similar items have been added to the tops of most tables and counters inside the sprawling home. Defense items like scissors and letter openers can be found in desks, while fragile tea cups and wine bottles can be plucked from tabletops to throw for a quick distraction. Those two items types tell you a lot about the mechanics of the game, which value stealth and wit over outright combat. You can defend yourself, and will sometimes face unavoidable attacks, but survival favors those who make use of the mansion’s plentiful distractions. When entering the mansion, one of the things players will quickly notice is a plethora of hiding places. Interacting with room dividers and large cabinets causes main character Rosemary to hide, letting you know that you’ll be stealthing your way through the game. I spent a lot of time trying out all of the different spots to hide in and wondering when they would come into play. While they don’t come to much use in the demo, my first thought on them is that they seem plentiful enough to keep players from being discouraged but distant enough to create tension. That’s a hard line to balance in a stealth game, but I feel like Remothered is handling it well. I did ask Chris about the hiding places, and he informed me that there will be more places to hide in the final product, with Rosemary crouching behind couches or dashing through nearby doorways to evade the mansion’s crotchety owner. I don’t want to spoil any of the story or gameplay, especially since the demo starts inside the mansion when players will first meet the game’s main enemy. Suffice to say, you’re going to be spending some time running around a mansion, hiding from a homicidal old man wearing nothing but a butcher’s apron. It’s a jolly good time, and the base mechanics of the game are certainly there. 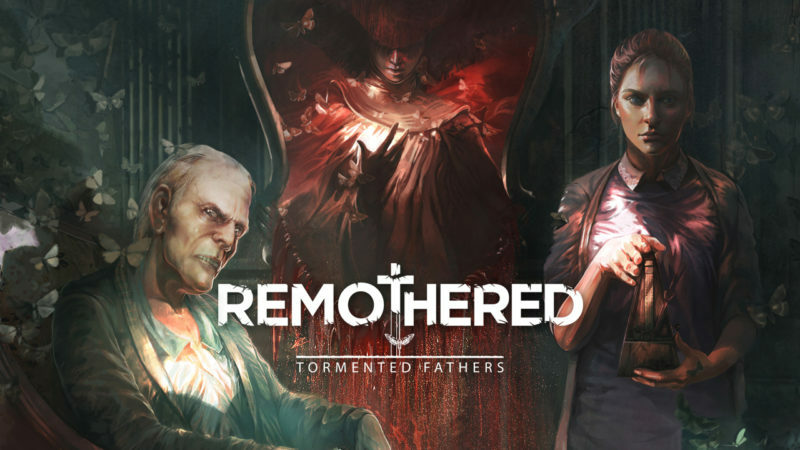 Fans of stealthy, thinking games are going to love Remothered: Tormented Fathers, and it seems like a natural fit for players who enjoy high-tension games. I’ve resisted the urge to ask Chris for more details of the story so that I don’t ruin it for myself, but I am extremely excited to get my hands on the final version of this game. Knowing that this is an incomplete demo, I’m expecting that the end product is going to be great. It will be a little while before players can jump into Remothered: Tormented Fathers, but there is a ton of material to view in the meantime. Chris is active on both Facebook and Twitter, and the Remothered website has information on what to expect from its gameplay, as well as dozens of screens to view and a signup for the beta demo. When it does go live, Remothered: Tormented Fathers will be available on PC via Steam, and as a digital download for PS4.